Dual Twisting Lock Head: The TK225 receiver hitch lock features dual twisting lock head and end portion that makes the lock resistant to saw cuts. Secures Trailered Vehicle: Provides instant security for your camper, boat or trailer by securing your vehicle receiver hitch. Features patented 1/4 turn technology that cannot be false locked. Fits 2" Receiver Hitches: The 5/8" pin fits all 2" Class III, IV and V receiver hitches. Type E key which is a European styled flat key providing excellent security. Knurling on end portion adds style and grip. Width between heads (exposed pin length) is 2 5/8". 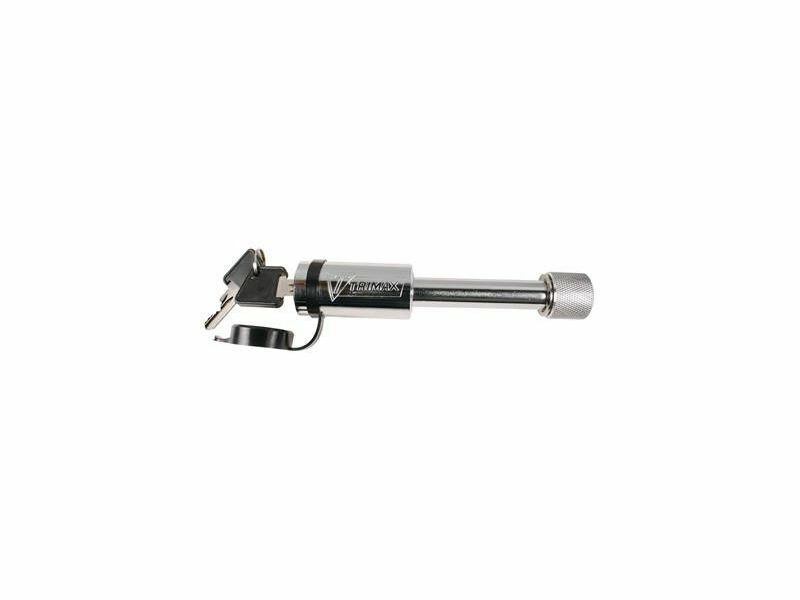 TRIMAX Twister Series 5/8" Receiver Hitch Pin Lock. The TK225 features dual twisting lock head and end portion that makes the lock resistant to saw cuts. Provides instant security for your camper, boat or trailer by securing your vehicle receiver hitch. Features patented 1/4 turn technology that cannot be false locked. The 5/8" pin fits all 2" Class III, IV and V receiver hitches. Comes with a weather protective cap and Type E key which is a European styled flat key providing excellent security. Premium chrome plated finish with knurling on end portion adds style and grip. Width between heads (exposed pin length) is 2 5/8". This product is fully warranted to be free of mechanical defects for the life of the product. This warranty does not cover normal wear and tear associated with the products use. If a mechanical defect occurs, call TOLL FREE 1-866-796-8500 for instructions on how to have it replaced or repaired free of charge. This warranty is null and void if the lock was used for purposes for which it was not designed. TRIMAX / WYERS PRODUCTS GROUP IS NOT LIABLE FOR INCIDENTAL, INDIRECT, OR CONSEQUENTIAL DAMAGES. Some states do not allow the exclusion or limitation of incidental or consequential damages, so the above limitation or exclusion may not apply to you. This warranty gives you specific right, and you may also have other rights that vary from state to state.